Updated 11-15-2018 --- The mod has been updated to work with the 1.47.49 (November 13, 2018) game patch. 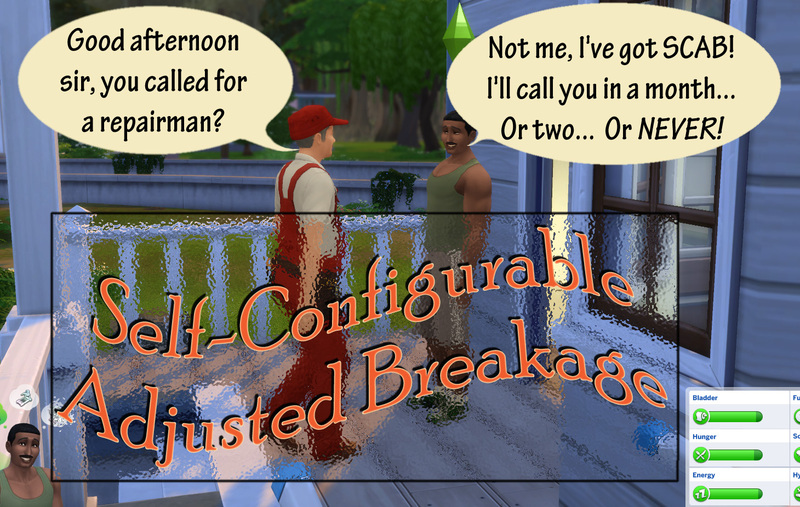 The Self-Configurable Adjusted Breakage mod allows players to alter the breakage of all in-game objects to a percentage rate they prefer. The breakage rate can be configured to any percentage from 0 (no breakage), to 100 (the normal rate), to 1000 (10x the norm). The percentage can be tuned by editing a text configuration file using any text editor. The included configuration file is pre-tuned to 50% of normal breakage (things break half as often). Changing the configuration value will require a game exit and restart in order to process the new value. Seriously? SCAB? Another stupid acronym? What makes this different from other "break less often" mods? The other mods attempt to alter breakage by editing the XML tuning for various actions in the game. There are so many of these that some are simply missed, too difficult to tune, or would cause too many compatibility problems by altering the tuning. In addition XML mods can have a tendency to conflict with one another. Does it work with *********** objects? Yes. This affects ALL the objects in the game that can become broken, even the ones other mods miss (computers, TVs, stoves, refrigerators, you name it). It interecepts any changes to the "brokenness" of an object and alters it by the percentage you set. What about compatibility, won't this mod break one day? The script methods that are intercepted by this mod have only changed once since The Sims 4 came out, for the 1.47.49 (AKA Python 3.7.0) game patch. Although this mod was written and tested with the latest version of the game at this time (Nov. 13, 2018 game patch) it should work with all versions of the game post version 1.47.49. Does it work with the *** *** *** game/expansion/stuff pack? I downloaded a ******* and it breaks all the time, will it work with that? Ok, this is less of a yes than the others. But if the object designer used the same "commodity" used by all other Sims objects in the game to track breakage, it will work. Yup, until EAxis decides to change those methods they've been using for the past three years. Which they will probably do with the next game patch because, hey it was working fine but now there's a mod out! Sabotaged items may not break on the very next use as intended by the game, although unless a very low percentage is configured they are likely to break eventually. I think I tried a configuration as low as 10 and everything except the high-reliability TV broke after five or six uses. A configuration file is used to tune the breakage percentage used in the mod. This is a standard text file and should just contain an integer (whole number) ranging anywhere from 0 to 1000. A default configuration file comes with the mod set to the value of 50 percent. This means by default things will break half as often. Use 33 to have things break one-third as often. 75 to have things break three-quarters as often. 100 means things break normally. 99 means things break just the barest smidgen less often. 200 means things break twice as often. 1000 means things break ten times as often. 1 means things should break nearly never (maybe two or three times in a Sim's entire lifetime). Oh yeah, 0 means don't let stuff break at all. This mod was written and tested on Windows for The Sims 4 version 1.47.49 (Nov 13, 2018). However it should be compatible with any game patch past that point (until EA changes those functions again, which seems unlikely - or changes the Python version again, also unlikely). The script uses features of the game that have been unchanged since the game was released and are not likely to break in future patches. 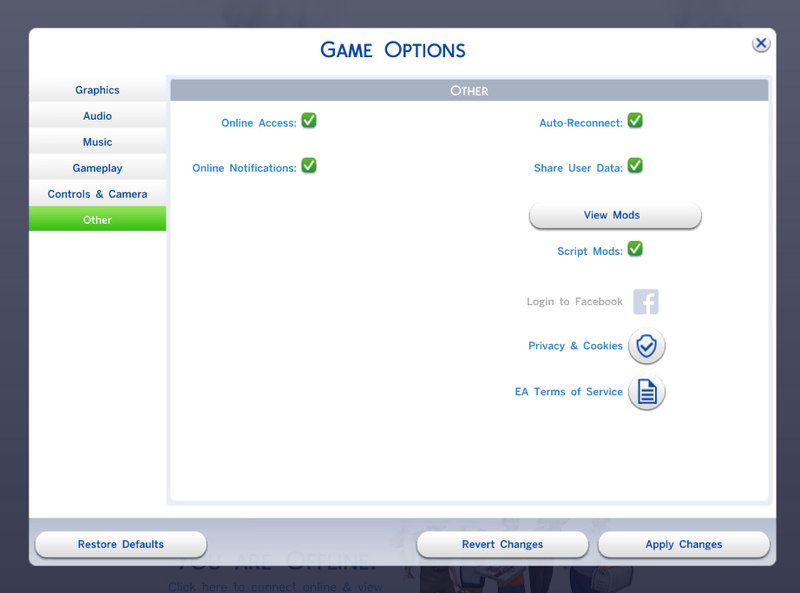 This mod uses the ts4script file format. Simply place the MTS_Scumbumbo_Self_Configurable_Adjusted_Breakage.ts4script in your mods folder, or a maximum of one subfolder deep. The MTS_Scumbumbo_Self_Configurable_Adjusted_Breakage_CONFIG.txt should be placed in the same folder you install the script file into. It will be created automatically with the default value of 50 if not found.